A white cross on a red background, reversing the Cross of St. George, divides the Shield into quadrants with the Royal Lion (supporters of England's Coat of Arms) in the upper-left and lower-right quadrants and Unicorns (supporters of Scotland's Coat of Arms) in the upper-right and lower-left quadrants. The Crest is unique in that the Shield is topped by an image of an elk, remarkable in the fact that elk never inhabited Newfoundland or Labrador. Caribou, however, were and are commonplace. The elk is most probably used due to the fact that none of the English heralds of the 1600's had ever seen a caribou and, therefore, could not draw one. They did, however, know what an elk looked like and this animal was used instead. The red and gold twisted ribbon on which the elk stands represents Newfoundland's British heritage. The Supporters, two Beothuk warriors standing on a mossy knoll, hold the Shield. The Beothuk, now extinct, were a peaceful and gentle people. However, following their disasterous and deadly encounters with the early Vikings who settled in northern Newfoundland, it is believed by historians that the Beothuk took up arms and ultimately drove the Vikings from the New World. Following the expulsion of the Vikings, the Beothuk became virtual recluses. In fact, in all history, there is only one recorded encounter between the Beothuk and early explorers. You may read about this encounter in my Brief History of Canada section. The Motto, QUAERITE PRIME REGNUM DEI, means "Seek ye first the Kingdom of God", taken from the Book of Matthew. 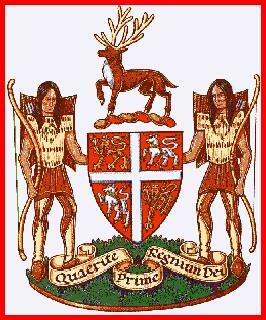 This Coat of Arms and much of its history ultimately became lost and, in time, was forgotten. It was rediscovered in the 1920s and officially adopted by Newfoundland. Labrador has an unofficial Coat of Arms.